May not be available in 2016, ask before ordering. We may have the VINTAGE models though. Add a CBI Ultimate 15 foot Guitar Cable $25 [Add $25.00]Add a great sounding 15 foot long guitar cable, black with straight metal soldered Neutrik ends. Analog Man carries the Black Cat Mona Wah Modern, Standard version. Features a special custom tuned Black Cat inductor, as well as the newly engineered Black Cat wah pot, a sophisticated tone-sculpting tool instead of a mere novelty quack machine. The new Black Cat Mona Wah was designed with the help of DIY guru and wah master, Joe Gagan, and features a revolutionary breakthrough in traditional wah-wah design. The Black Cat Mona features a special custom tuned Black Cat inductor, as well as the newly engineered Black Cat wah pot, which is like nothing else on the market. These features allow the Black Cat Mona to be used as a sophisticated tone-sculpting tool instead of a mere novelty quack machine. Designed by Joe Gagan, the Black Cat wah pot features a new taper and redesigned gear which yield a subtly of expression never before possible with any other wah. This unique new design allows for a totally smooth, even sweep that covers the entire range of the pot, which places it in a league above the compromised design of the ICAR and other condensed or "S taper" pots. 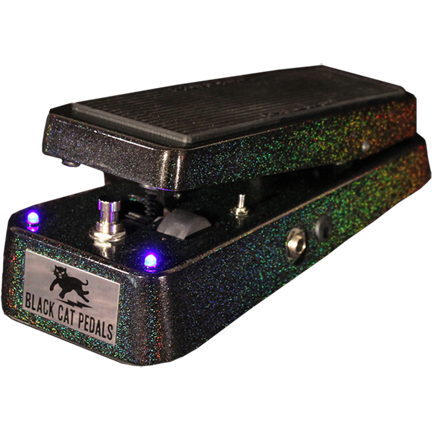 The Black Cat Mona wah Modern uses Dale precision resistors and Wima film capacitors, and is optimized for a clean, full frequency response. All the standard Black Cat Mona Wahs have three internal trimpots (Frequency, Q, and Volume), plus a built in buffer with an external mini-switch that allows you to bypass the buffer completely. The Volume control is for the output level when the buffer is engaged. The Q and Freq controls are for adjusting the Q (resonant peak or sharpness) and the Frequency range. By experimenting with these controls you'll be able to achieve a number of subtle and intriguing tone-shaping effects, including passive tone control and pedal-steel type swells. Of course, when a good old-fashioned wah-wah is what you need, the Black Cat Mona can wakka wakka with the best of them.